ADA One is a consulting firm drawing on the three decades of experience of Irene Bowen, J.D., and Larry J. Goldberg, J.D. Our services reflect our practical knowledge and insights into federal expectations for compliance. Our firm offers one source for learning about and complying with the Americans with Disabilities Act (ADA) and related laws. 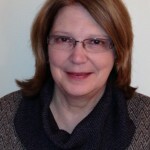 ADA One consulting grows from President Irene Bowen’s thirty years of experience – and results – as Deputy Chief of the Disability Rights Section at the U.S. Department of Justice and as Deputy General Counsel of the U.S. Access Board. She achieved ADA compliance through landmark litigation, settlements, and education. Ms. Bowen doesn’t just know, study, and apply the laws and regulations – she wrote and enforced many of their provisions. She understands what’s behind them. She grasps what the federal government expects for compliance, how it operates, and what it may do next. 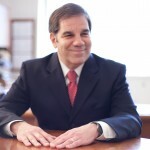 Larry J. Goldberg, JD, CHC, joined ADA One, LLC, as a partner, in September 2013. Mr. Goldberg was most recently the Principal Deputy Inspector General for the U.S. Department of Health and Human Services (HHS). He now applies his experience, expertise, and collaborative approaches to advancing compliance with the ADA, returning to the area in which he began his legal career. Prior to joining HHS, he had served as Associate Legal Director of the National Center for Law and Deafness, had litigated cases on behalf of individuals with disabilities for the Civil Rights Division of the Department of Justice, and had been an Assistant Attorney General for the Maryland State Department of Health. ADA One has collaborative relationships with experts in specialized fields – such as architecture, accessibility of web sites, information technology, employment, and housing – and draws on their services when they’re needed. ADA One provides ADA consulting, speaking, and compliance assessment services to public and private entities for titles II and III of the ADA, as well as assistance with section 504 of the Rehabilitation Act and other disability rights laws. You can choose from a full menu of services, tailored to your needs. DOJ's revised regulations of 2010 – the first major revisions since the ADA was enacted -- bring sweeping changes for the next decades. Amendments to the ADA itself – effective January 1, 2009 – sweep more individuals under the ADA’s protections. The amended rules have been in effect for all purposes since January 2013, with most provisions taking effect in March 2011 or March 2012. New accessibility standards apply to new construction and alteration projects, and many existing facilities are also affected even if no alterations are otherwise planned. Changes affect a wide range of policies too – from service animals and Segways to communication and event ticketing. More regulations will come soon. DOJ is expected to propose rules addressing web sites in 2013, followed by requirements for equipment and furniture and other areas. The U.S. Access Board is developing guidelines for diagnostic medical equipment, outdoor developed areas including trails, shared use paths, and streets and sidewalks, all of which may be the basis for future DOJ standards. DOJ has also brought enforcement actions, entered settlements, or filed briefs as to emergency management planning and preparations, higher education, access to electronic information, communication with people who are deaf or hard of hearing, and food allergies. DOJ and the U.S. Department of Health and Human Services have stepped up enforcement of the rights of people with disabilities to access health care. Learn more about managing ADA-related changes. ADA One can help you get your bearings, spend your limited resources in a way that makes sense for you, and plan for compliance. We gather information about your current policies and practices from interviews with program managers (conducted by us or by your trained staff) and more open-ended but focused interviews for some types of programs. We apply our in-house data analysis capabilities to information gathered, to provide a report of our findings, at the level of the City/County/entity, department, or program, along with recommendations. We assist you in developing an action plan. We develop a “living” automated project management system for you to use in tracking completion of the changes called for in the action plan. 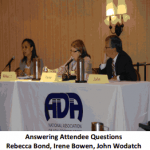 July 2013 –The ADA Compliance Guide and HR Compliance Expert published Irene Bowen’s article about the first public presentation of Rebecca Bond, the new Chief of the Disability Rights Section at the U.S. Department of Justice (DOJ). She spoke as keynote presenter in April 2013 at the twice-a-year conference of the National Association of ADA Coordinators (NAADAC). Ms. Bond signaled that DOJ will not only continue its strong enforcement of the ADA but also venture into new arenas that affect people with all types of disabilities, various types of public accommodations, and state and local governments. Read the article [PDF, MS Word], with highlights about her comments as to education and technology, individuals with epilepsy, health care providers, other public accommodations, the future of Project Civic Access, recreation facilities, Olmstead litigation, and rulemaking. 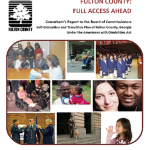 The County of Fulton, Georgia, which surrounds Atlanta, has published ADA One’s report under Phase One of the County’s Self-Evaluation and Transition Plan. See the full report, Fulton County: Full Access Ahead. The Georgia State ADA Coordinator’s Office has issued an update by ADA One and LCM Architects to its technical assistance manual for design and construction professionals. The user-friendly manual gives an overview of federal nondiscrimination laws and how they relate to each other, reviews some of the major changes in the 2010 Standards, and alerts readers to pending federal guidelines and standards. It also explains the concepts of universal design and program accessibility, with examples, and makes practical suggestions about procurement. These cover architectural and engineering services, consulting services, property leases, building projects, equipment, and printing. It outlines areas that need attention during design and plan review and offers tips for maintaining accessibility and ensuring access to historic facilities. It includes resources and a maintenance checklist. NEW ADA GUIDE, January 2011: Renewing the Commitment: An ADA Compliance Guide for Nonprofits, reflecting the new DOJ regulations, with best practices, tip sheets, extensive resources (press release [PDF]) and (guide). Read more about the guide here. Authored or co-authored three ADA guides: one for non-profits, one about facilities, and one about access to the courts (pending publication).